How should you set up your building’s wireless infrastructure? Based on your needs and current building infrastructure, there are many options available – but not all of them might be a proper fit when considering your next smart building project. When reviewing your options, I always recommend looking at what matters most to your building. In my experience, building managers are looking for a system that balances security, reliability, and affordability. Very few network infrastructures will get a passing grade on all of these metrics. Equally important to understanding your ideal network infrastructure is understanding what your system will be used for. Setting up a system to handle large amounts of data will require different hardware than setting up small data packages. This is measured by bandwidth – how much information is being processed through the network. The classic example of setting up a high-bandwidth network is Wi-Fi. A Wi-Fi network provides a high bandwidth capacity, so you can set up video calls or stream Netflix films. Bluetooth technology is another example of a high-bandwidth network, as demonstrated by hands-free voice calls. However, Wi-Fi and Bluetooth are both range-limited networks – their signals will only go a certain distance before getting too weak to use. This is a reliability concern – you might not always have a signal where you need it. There are solutions to increase your Wi-Fi or Bluetooth network reliability, of course. Repeaters will act as a hopping point for wireless signals, amplifying its network distance. If you set up enough repeaters, you should be able to cover your entire building, eventually setting up what is known as a mesh network topology. 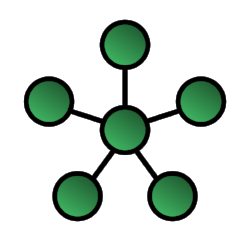 A mesh topology is a configuration of sensors that are all interconnected to each other. This way, data doesn’t have to go in a straight line, but can jump from point to point until it gets where it needs to be. Mesh networks require more repeaters to be within range of one another to ensure data reliability. That’s great for system uptime – however, it is very expensive to install. Additionally, there is a security risk with setting up this type of system because if a hacker breaches one repeater, they get access to the rest of the network. We’ve seen examples of what happens when someone gets access to a system via a Wi-Fi entry point, and the results are pretty grim. As a result, it’s no longer a preferred option for businesses concerned with their data. There are alternatives to setting up a mesh network, to help reduce the capital cost of setting up your building’s system. There are more than we have time to go into detail on today, but there is one network that presents a real opportunity for commercial building security. A star network topology is a point-to-point contact where a system’s endpoints communicate only with a router, and not with each other. As each endpoint acts independently of each other, you are increasing your security protection – if hackers gain access to an endpoint, depending on what kind of information is being sent to that point from the central hub they would not have access to your full system. What suffers under many of today’s star topology infrastructures is reliability. For example, a star network using Wi-Fi would work great for a small office where the router signal can reach the entire room’s footprint. But once an endpoint is outside of the natural range of a router’s signal, it can no longer connect to the network. You could set up multiple routers, but that becomes another expensive solution, and still does not solve the problem of having a single, fully integrated network. That means, practically speaking, that Wi-Fi and Bluetooth star network topologies are impossible for a large commercial building. ioAirFlow's network uses a different network type than Wi-Fi or Bluetooth, which has a greater range through buildings and doesn't have to interact with your current wireless infrastructure. We offer what conventional wireless companies don't: a secure network on a star topology, that provides a reliable network signal to ensure system uptime. Best of all, our solution is affordable - a fraction of the cost of setting up a mesh network. Have questions about what network is the best for your building, or want to know more about ioAirFlow's system solution? Contact us today.